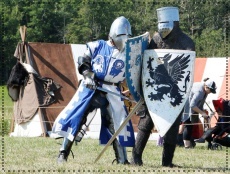 Two days, dozens of historical reenactors, sword fights, big cannons, and live combat! STEP BACK IN TIME and visit with costumed (and sometimes armed) performers representing 9th C Scandinavia, 11th Century England, 18th Century England, 19th Century Canada, and 20th Century Germany. <!-a href="http://www.mountainviewartssociety.ca/daysyore/poster18.pdf" target=_blank><!-img src="http://www.mountainviewartssociety.ca/daysyore/poster18.jpg" width=300 height=466 border=1 align=right Alt="Click here to download and print our Days of Yore poster. See you there! "><!-/a>You'll "Stroll Through the Ages" in our reenactment village with the Sons of Fenrir Vikings, Dragons Own Medieval Combat Group, Victorian Society of Alberta, Edmonton House Brigade, Yankee Valley Yankees, 10th Battalion (CEF) Commemorative Association (WWI), WWII First Special Service Force Reenactors, and the Prairie Motor Brigade! Battles throughout the day, music with pipers and fifers, sing-a-longs, storytelling - and did we say - BIG CANNONS?!! And there's more! You can shop in our Artisan Alley seeing heritage arts and traditional crafts in keeping with the character of this festival. This is the only festival of its kind - dedicated to historical authenticity, where you can see soldiers from throughout history intermingling with each other - and you! 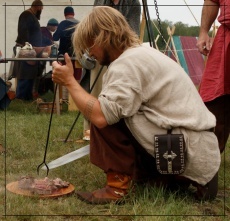 Experience life as a Viking, as one of King Arthur's Knights, as a fur trader with the Hudson's Bay Company, or a commander during one of the World Wars! 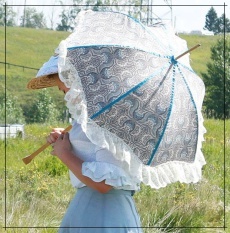 And for the more delicate, come dressed in your finest and join Queen Victoria's friends in a rousing game of croquet! Yes, we encourage your family to come dressed up in your favourite period costume and join in on the fun. Make sure you take in Sunday afternoon's GRAND FINALE MELEE, when everybody tries to be the last man standing! THIS IS GONNA BE A BLAST!! 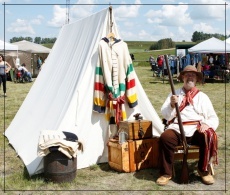 Days of Yore Reenactment Festival - Didsbury AB from Olds Institute on Vimeo. ARTISAN ALLEY APPLICATIONS ARE NOW OPEN! And many arts programs in the community.